The Bartlett Arboretum & Gardens grounds are open to the public seven days a week, from dawn to dusk. But did you know that the Arboretum could also be visited 24 hours a day from anywhere? 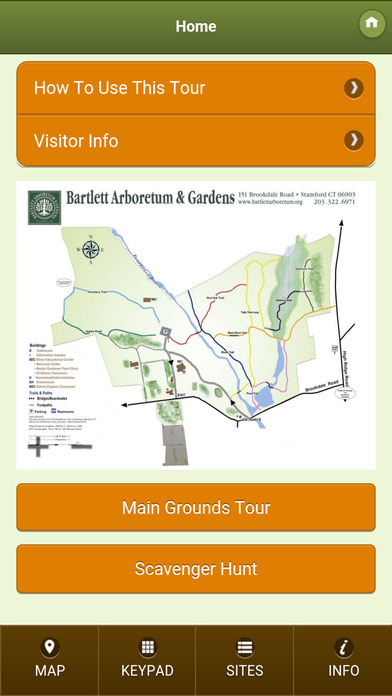 The Mobile Touring App was created by a group of dedicated staff and volunteers, including many of our Master Gardeners, who shared their creative ideas, knowledge, talents and advice to create this wonderful resource that promotes the Bartlett and makes it available to everyone. The Mobile Touring App, or “App,” can be downloaded from the App Store free of charge. The App is extremely user friendly – even for “non-millenials" -- and includes a map and a list of nearly 50 sites. For example, if you are on the Main Grounds and find yourself standing in front of site 102, you are at the Perennial Border. You can click on link 102 to read or listen to the transcript. You can also view the photo slide show of this beautiful garden in bloom. Tap a lower button and learn about our certified Monarch Waystation. The App also includes a How to Use this Tour button. Using the App is a lovely way to visit the Bartlett from anywhere, preview notable sites before arriving, and allows you to utilize the map and guide as you walk or hike the Main Grounds and the Thielens Memorial Ecology Walk. The Bartlett’s collection of horticultural treasures includes an abundance of rare and native trees, beautiful gardens, natural habitats and landscapes. But beware – there is so much to see and enjoy you may miss some of our many notable treasures! The App can lead you to particular points of interest that you don’t want to miss, such as the Dawn Redwood and the Bartlett Chestnut. We invite you to download the Mobile Touring App to your device and come visit us. Be sure to check back often as the App is continually updated. Spread the news and tell your friends that now anyone from anywhere can enjoy the beauty of the Bartlett!